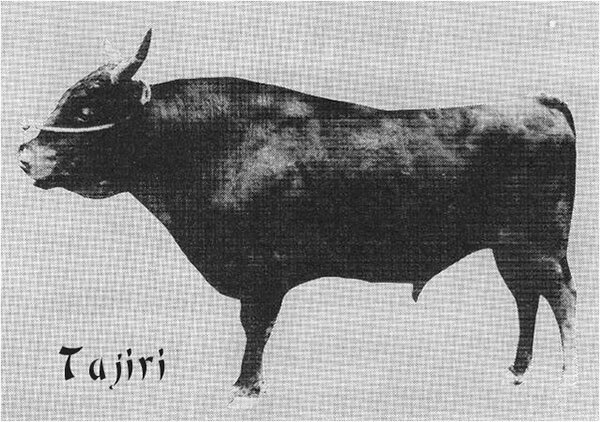 Hyogo (Tajima) Prefecture cattle are the descendents of the Tajiri, a sire born in Mikata District. These cattle have outstanding genetic excellence with finely marbled beef in combination with a smaller frame and lower growth rates. They are renowned for good temperament, longevity, serial reproduction, and soundness. Famous are the names Kobe Beef and Matsuzaka Beef, from herds produced in the Hyogo Prefecture using Tajiri bloodlines. Shorthorn, Devon, Brown Swiss were the foreign breeds crossed with the native cattle in this prefecture. Pictured to the left is an old rice paper picture of Tajiri. 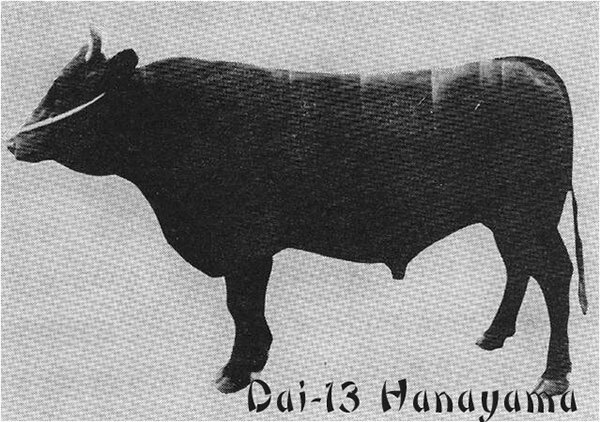 Okayama Prefecture cattle are descendents of the sire Dai-13 Hanayama. These are large size cattle with good udders, soundness, strong backline and loin, and fullness of hind quarter. They had a good horn color and exhibited a mild disposition. Excellent fertility was a key trait. Many of these cattle were used as pack animals. The foreign breeds crossed with the native cattle in this prefecture were the Shorthorn and Devon. Pictured to the left is Dai-13 Hanayama. 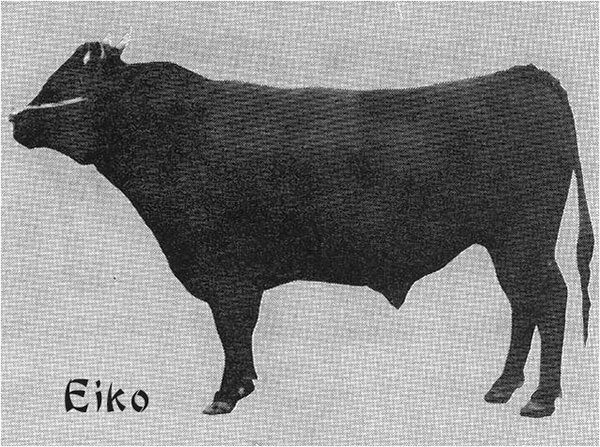 Tottri Prefecture cattle are descendents of the sire Eiko. The typical characteristics of these cattle include good growth, larger frame type, good top line, and overall balance. They are known for their fine, loose skin. The most prevalent is the Kedaka line which started in 1959. 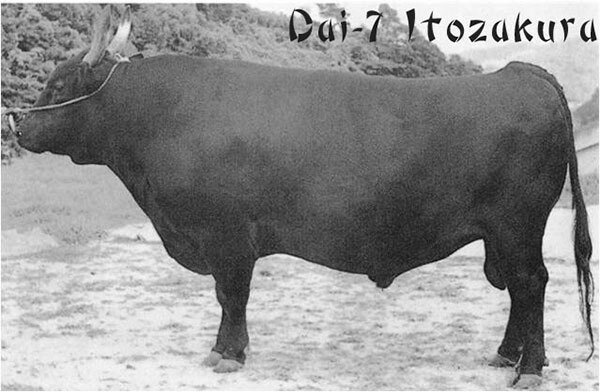 Dai 20 Hirashige is an important sire of the Kedaka line. The foreign breeds crossed with the native cattle in this prefecture were the Brown Swiss and Shorthorn. Pictured to the left is Eiko. 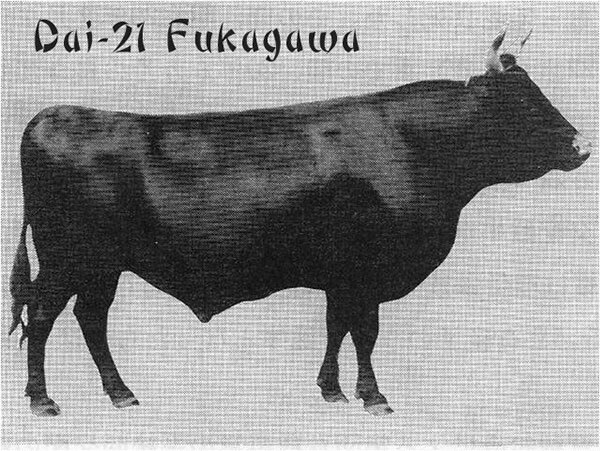 Hiroshima Prefecture cattle are descendents of the sire Dai-21 Fukagawa. These cattle are known to have a mild disposition, lovely looks, longevity, serial reproduction, superior body conformation, and good udders. The foreign breeds crossed with the native cattle in this prefecture were the Simmental, Brown Swiss, Shorthorn, and Ayrshire. Pictured to the left is Dai-21 Fukagawa. Shimane Prefecture cattle are well-balanced and produce calves with good growth rates and meat quality. They also have a quiet temperament and exhibit a strong maternal ability in dams, which consequently also have very high fertility rates. The foreign breeds crossed with the native cattle in this prefecture were the Devon, Brown Swiss, Simmental, and Ayrshire. Dai 7 Itozakura pictured to the left is probably the most famous of the Itozakura line and is shared with the Okayama Prefecture. Mr. Shogo Takeda used this bloodline to develop much of his cow herd as well as many of his foundation sires. Not all of these bloodlines are represented in Wagyu outside of Japan because the Japanese government banned any additional exports of Wagyu genetics around 1994. This was in connection with the Japanese government realizing the value of Wagyu and declaring them a national treasure of Japan. Therefore, the main bloodlines which are utilized by breeders outside of Japan are for the most part Tajima, Itozakura line, and Kedaka line.